This place (state of WA) doesn’t do brunch like I am used to. Like, they do breakfast & they think it’s the same thing. No, no, honey children. Breakfast = bacon + eggs + coffee. Brunch = an elegant hash + mimosas. There is a clear difference & I feel responsible for educating the masses. We’ve been searching & searching for real brunch near us. Like, I want to wear a cutie sundress & straighten my hair for once, please. I would normally require a patio but unless I want to wear a parka it wouldn’t be that enjoyable. After a rigorous google search, we were sold on one with a very specific selling point: bottomless mimosas. Of course I was inspired & now have yet another food truck idea. Brunch + mimosas. I come to you in my hot pink food truck with glitter guns on either side & I serve you all of my favorite brunch items (v little egg on the menu, sorry friends it’s heinous). Mimosas out the wazoo. Maybe a mimo bar that I fold out of my truck & you can pick your own juice to add to the bubbles. ^ Consider this patented, too. & I do believe chicken + waffles will be my bestseller. This looks amazing! I’ve never tried chicken and waffles but it always looks like such a unique flavor combo. If you’re interested, I’d love for you to share a post in my link up tomorrow. There’s an explanation right on my main menu under ‘Tell ’em Tuesdays’. I can’t believe I’ve still never had chicken and waffles in my life! I know I’d love it since I am a huge fan of the mcgriddle! It looks so good! If I hadn’t literally just eaten half a block of cheese right before I read this I would definitely be in the kitched trying to make some version of this. Right now I have turkey legs and the ingredients to make pancakes… think that would be a hit? Hahahaha you have so much to still experience! But the classic block of cheese for dinner is still a staple in my home. I ALMOST made chicken + pancakes, but I caved & got a waffle maker… Yes it would totes work! Turkey legs would be a nice lil spin. Have you tried Portage Bay Cafe in Ballard. They have brunch and its really good! 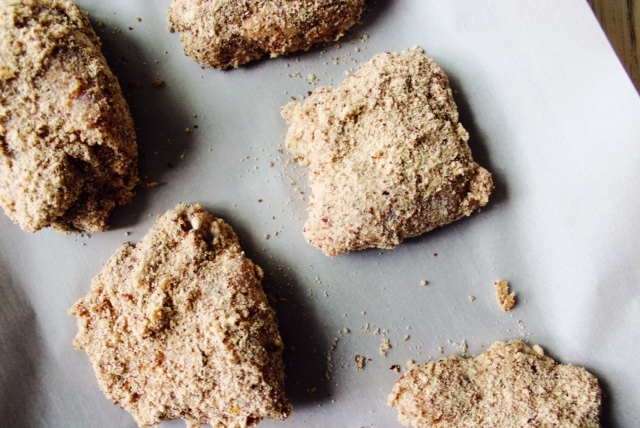 Chicken & Waffles is the shizznit and I’ve been looking for a healthy way to make it. Girl this looks AMAZING! 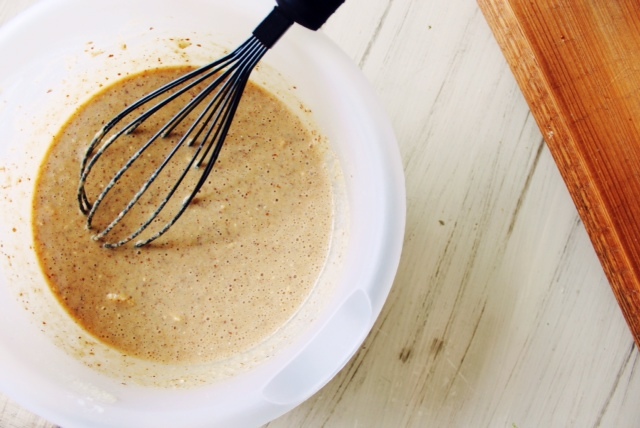 Will definitely have to make this one morning – what a perfect breakfast treat! Always been wanting to try Chicken and Waffles, but dang, that low carb diet!! lol Loving this post, and you kept me laughing 🙂 Will try! Now I gotta get some champagne for those mimosas. By the way, just saw a great food truck movie with Jon Favereau (sp????) The Chef. Very cute movie. Must see! 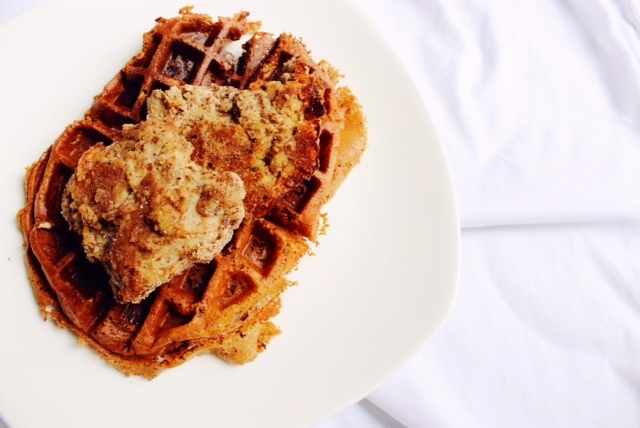 Can’t have chicken + waffles with a mimosa so make sure you have all the ingredients you need! 😉 & I’ve heard rave reviews about that movie. Thanks for the reminder – I’ve gotta see it! 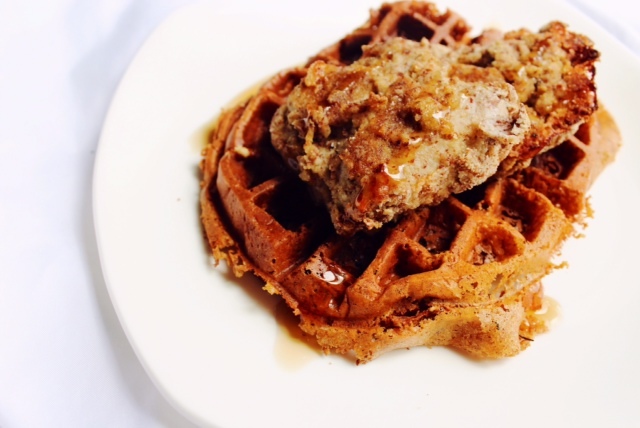 Love the idea of the cinnamon in the waffles, I bet it is great with the crispy chicken! Sweet & salty – the best! Hope you give it a try! 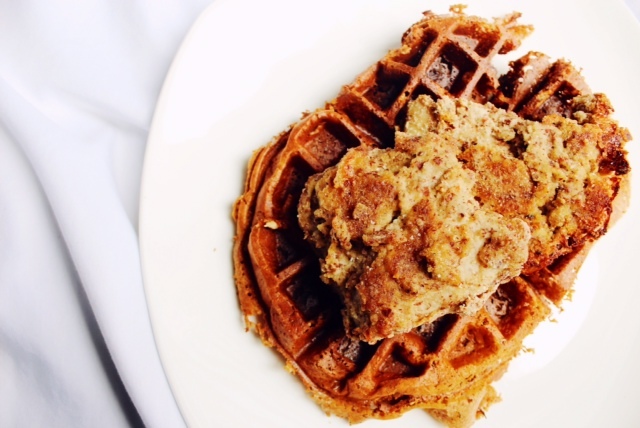 Paleo and Chicken and Waffles are two phrases that I never thought I’d hear together!! Hahaha not the easiest meal I’ve ever attempted, but worth it!